People with gingivitis have inflamed gum tissue around their teeth. This condition is caused by bacteria found in dental plaque. Normal, healthy gums should be firmly attached to the teeth and underlying bone. Normal gums are pale pink in light-skinned people. They are brown, gray or mottled in people with darker complexions. If you have gingivitis, your gums are inflamed, red and swollen. They will bleed easily and may be tender. Mild gingivitis causes little or no pain. You might not notice it. If left unchecked, however, it can become severe. In some people, gingivitis develops into periodontitis, which can lead to tooth loss. Plaque is a sticky film that collects on your teeth, especially in crevices and spaces or around rough or broken fillings. The bacteria in plaque produce substances that can harm the gums. If plaque is not removed, it hardens. In this form it’s called calculus, or tartar. Calculus irritates the gums. It also provides more surfaces that bacteria can bind to and grow. Gingivitis results from the gums’ response to the growth of bacteria. You will notice red, swollen, gums that bleed easily. Your dentist will examine and probe your gums. He or she will look for calculus deposits on your teeth and under the gum line. The dentist will ask you if your gums bleed when you brush or floss your teeth. Make sure your dentist knows the medicines you are taking. It’s possible that one or more of them may be contributing to your gingivitis. Gingivitis can disappear within about a week once you start a program of good oral hygiene. If oral hygiene remains poor, gingivitis likely will remain. It could get worse and turn into periodontitis. This condition can lead to significant loss of tissue and bone around teeth. Brush your teeth regularly. The best times are in the morning and before bed. Floss your teeth at least once a day. Make sure that you use a soft toothbrush. The bristles should reach the gum line when you brush. Have your teeth professionally cleaned by a Hygienist/Therapist every six months to one year. This can help to prevent plaque from becoming calculus. The cleaning also will remove calculus that has already formed. Gingivitis can be reversed if you remove the bacteria that bind to your teeth every day. 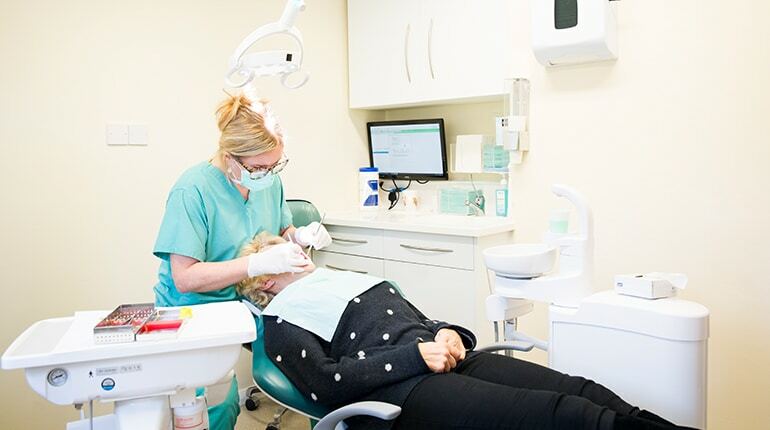 At your dental office, you will receive a thorough cleaning. Part of the cleaning is called scaling. This removes plaque at and just below the gum line. Your dentist or dental hygienist can explain the most effective methods of brushing and flossing. Gingivitis is easier to treat if you keep medical conditions, such as diabetes, under control. If gingivitis turns into periodontitis, you will need additional treatment. If your gums become tender or bleed easily when you brush your teeth, contact your dentist. The outlook is excellent, once you start a program of good dental hygiene. Symptoms can disappear in as little as one week.